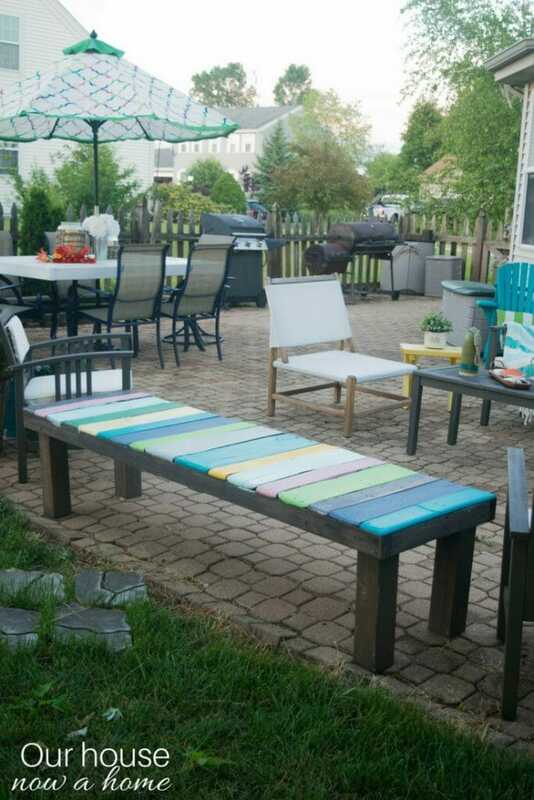 We all know by now that I love a good DIY project, one that adds extra seating, a pop of color and is crazy low cost?!! Um, yes please! 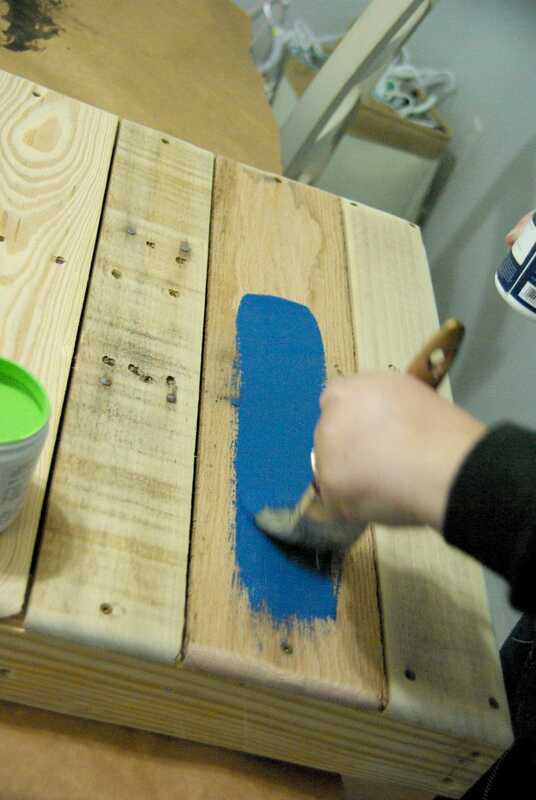 Today I am sharing the full tutorial for this DIY wood pallet bench, low cost and easy to make! Wood pallets are a great source for furniture. We have a neighbor that gets a lot of wood pallets because of his home business and always offers them up. I found this beauty of one, full of amazing wood. Our outdoor space is huge, the back patio has always felt over sized to me. 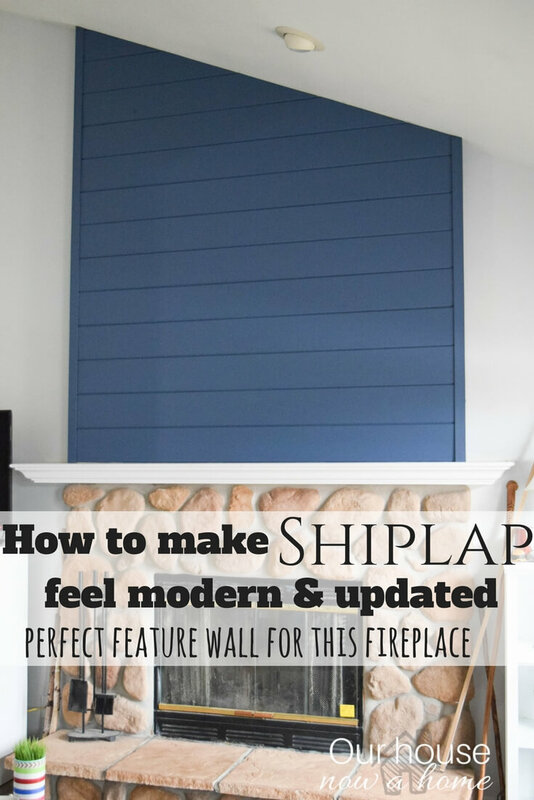 Which is almost always a good thing, but making that space feel cozy can be difficult at times. I wanted a long bench, to add some much needed seating. First step for this project is to break apart the pallet. 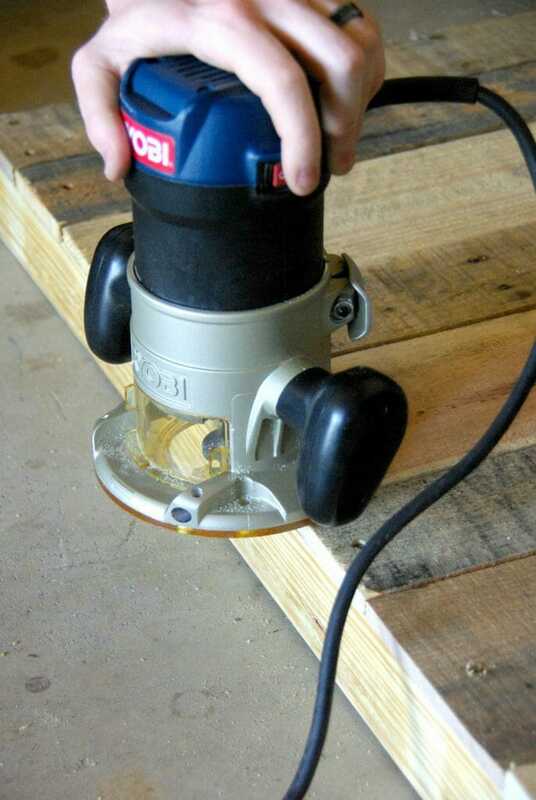 I used a saw zall (a electric, power saw) to cut apart the pallet. Also pulling out any nails that need to be taken out. Next is making the frame for the bench. 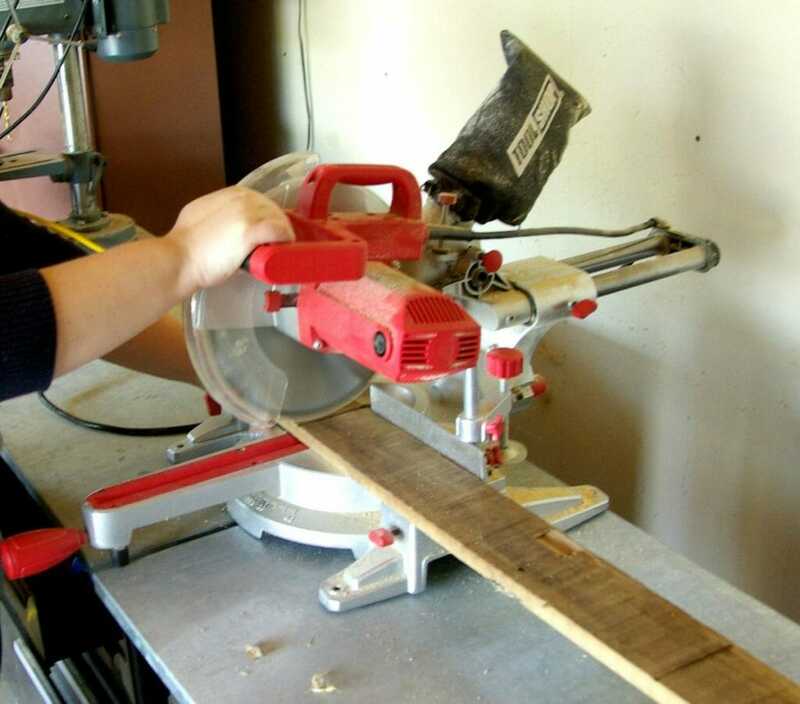 Using this sturdy pallet wood, and cutting one of the boards in half, long ways down the center. This will become the frame for the seat itself on the bench, cutting two long, and two smaller. 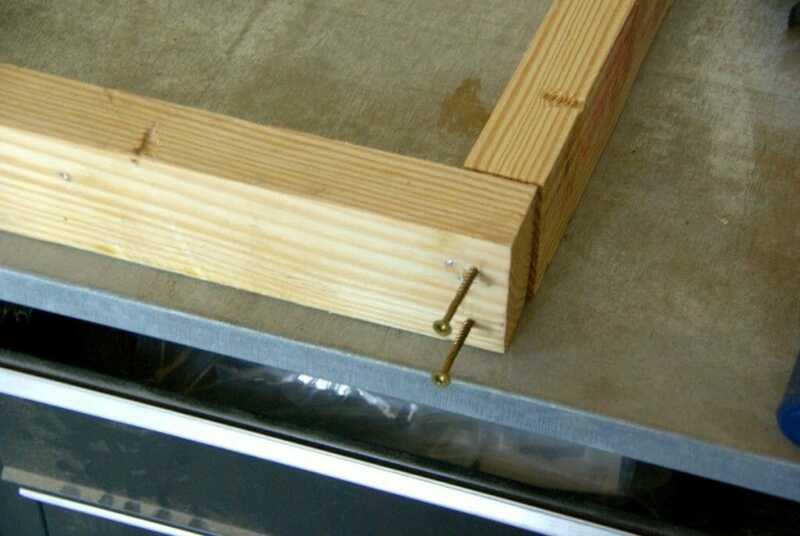 This created the front, back and sides to the bench. 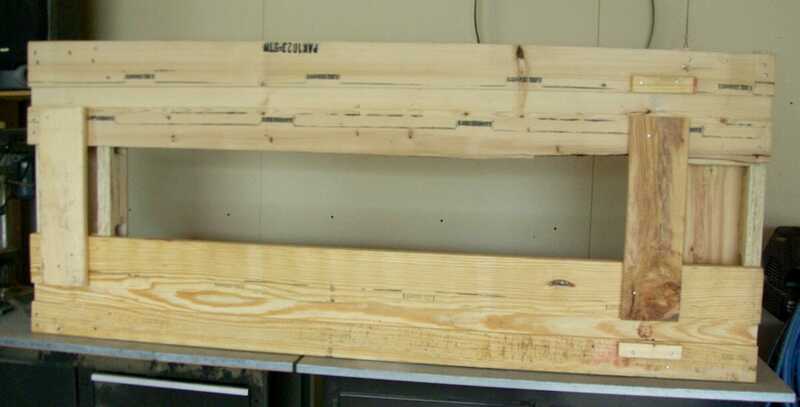 My bench is measuring 77 inches long, 21 inches wide and 18 inches tall for the legs. I chose this size bench mainly because it was the length of the longer wood from the pallet. 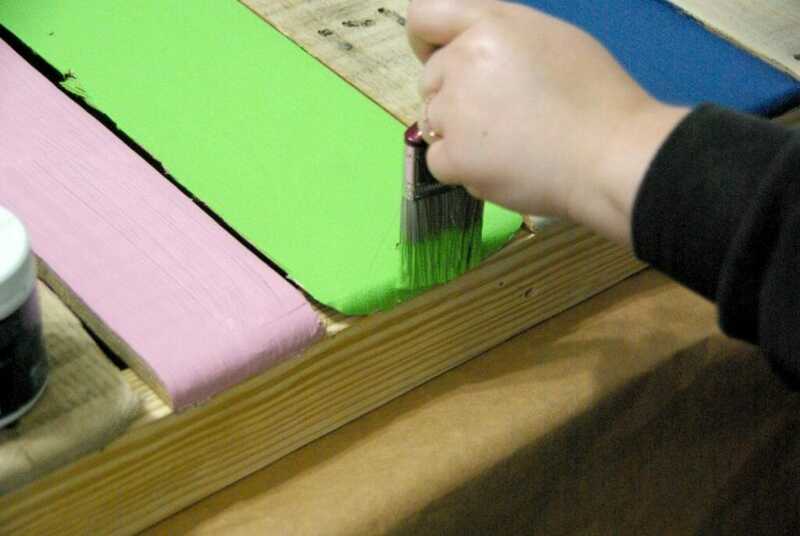 Once the 4 pieces were cut, set them in a rectangle shape with ends touching and creating the corners. 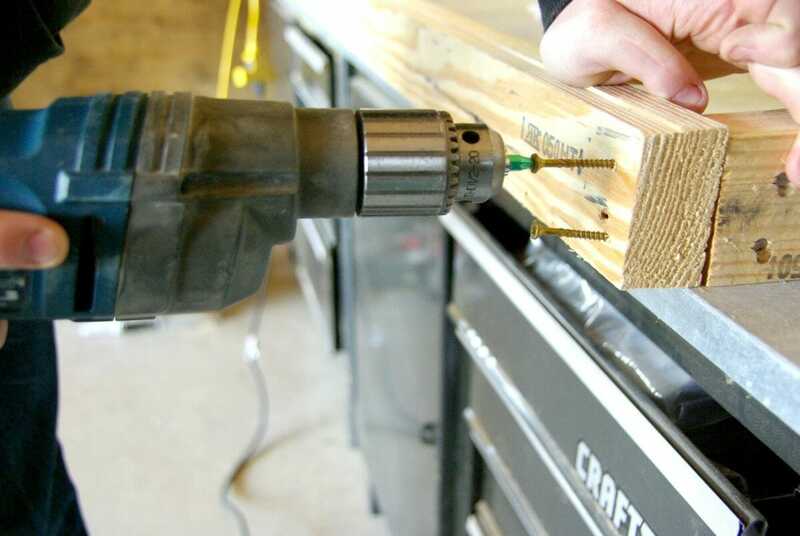 Using long screws and a automatic drill and screwing two into each corner. The longer ones were needed to get through the wood. With the frame made, it is time to put in the pallets for the seat itself. I had another pallet, which I took apart. 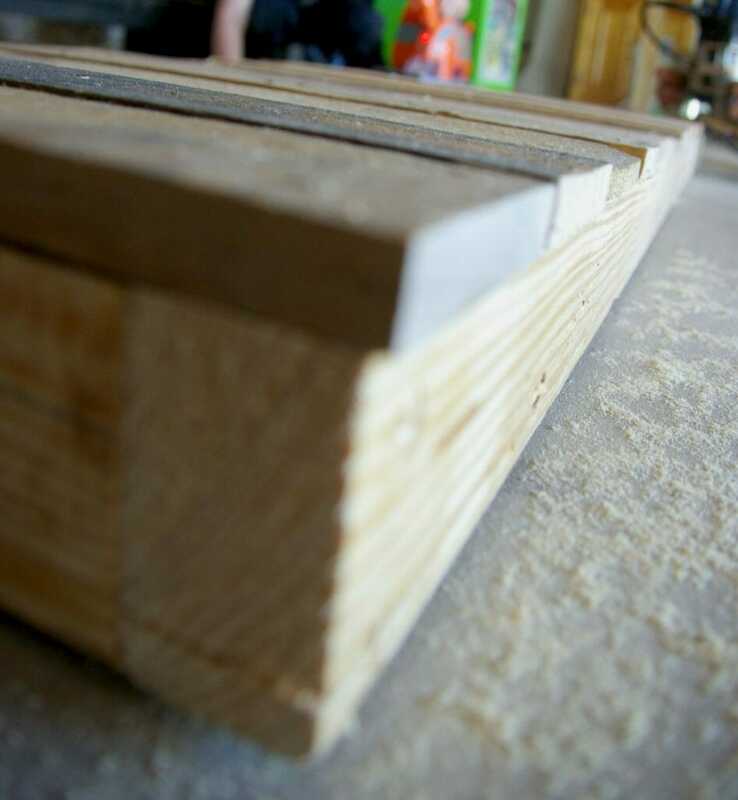 Lining up the pallet planks to the length of the bench frame. As you can see, the rough wood pallets work great. 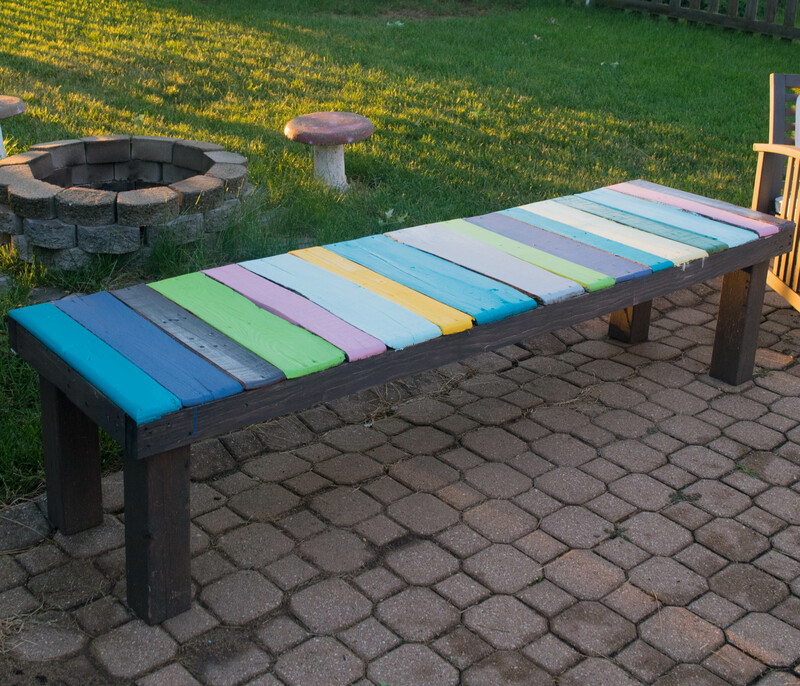 You do not need a flawless pallet to make this bench happen and turn out beautifully. 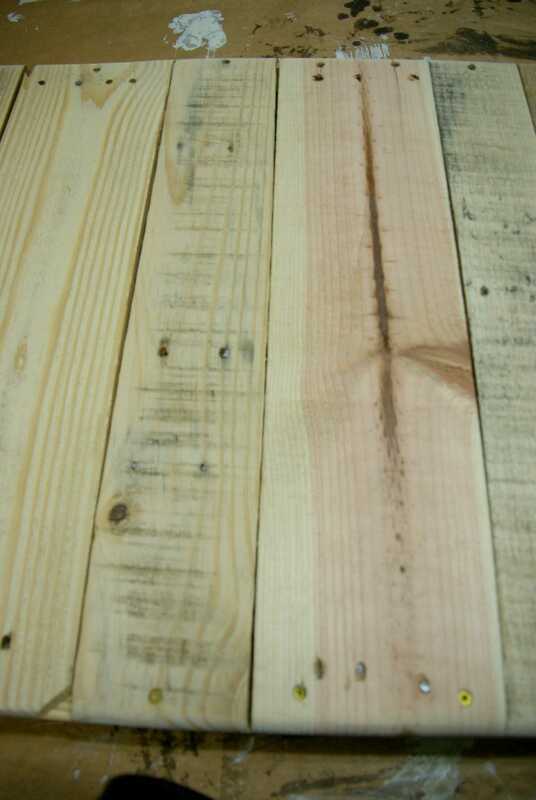 Set the bench frame on the pallet planks to see how things line up. 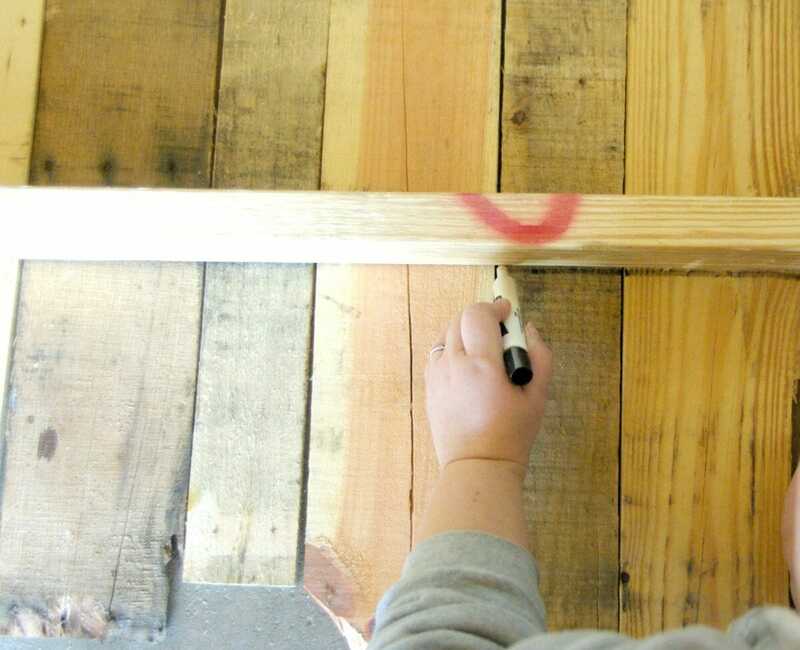 Using a marker and tracing around the frame onto the pallet planks. 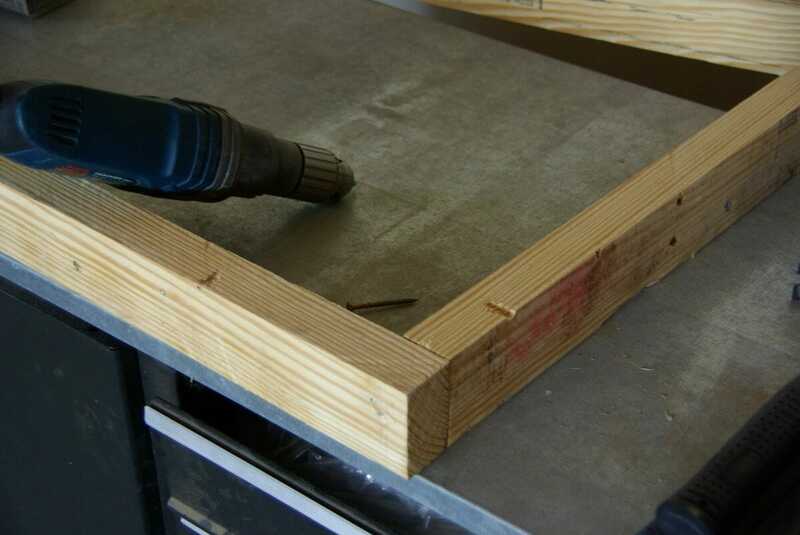 This will show where the cut needs to happen for each pallet plank to fit on the bench. Once all were marked properly cut each pallet using a table saw along the line on the pallet planks. Going one plank at a time. Line them all up to confirm that no additional cuts need to be made. 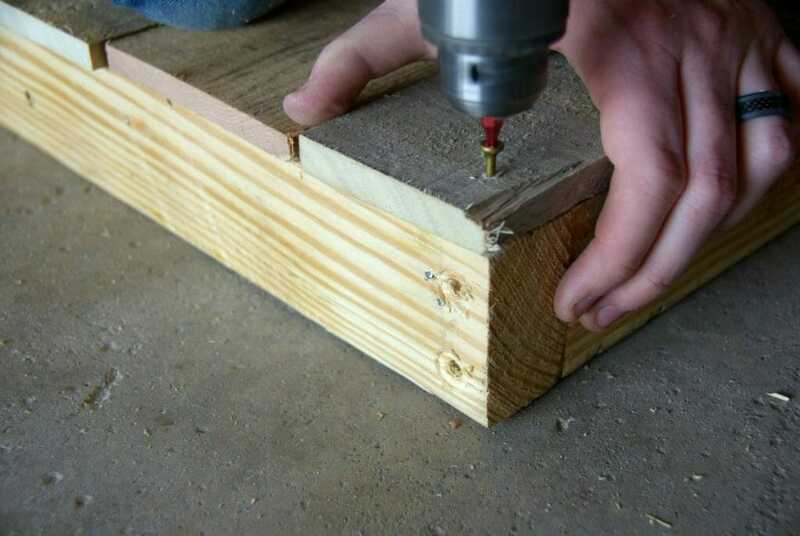 If all fits and it the right length, nail into place. Here is where using pallets can be a little daunting. Because they are pallets, the surface of them are rough. There is a lot of prep that needs to go into making them not be painful and too rough when sitting on them. 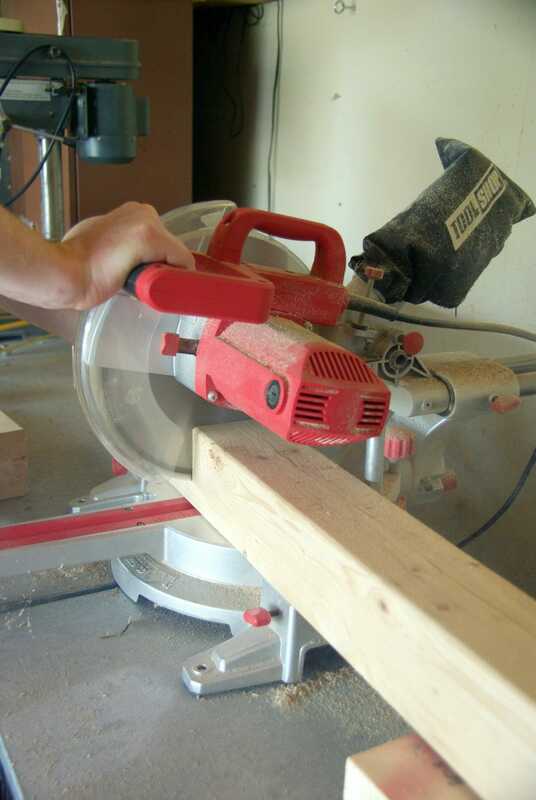 The first step for is softening the edge of the top with a router. 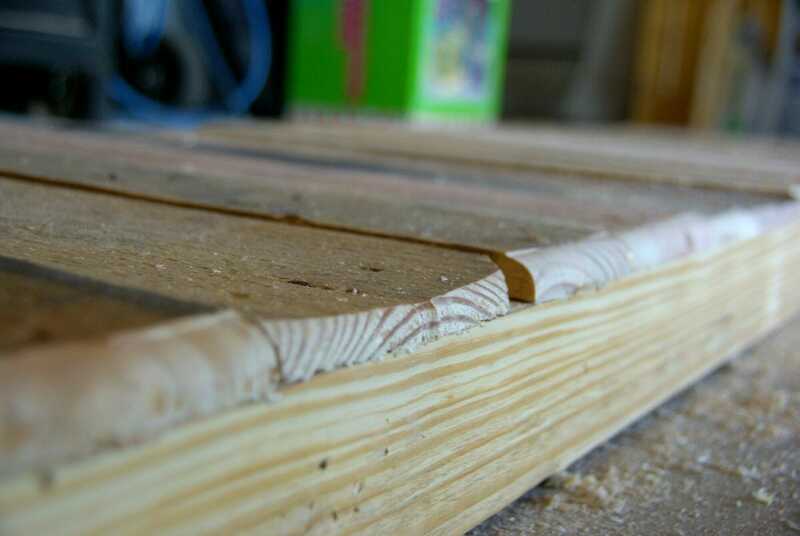 creating a small slope to the ends of the boards. Using a rounded bit for the top of the router. Running it along the side edge of the bench top. 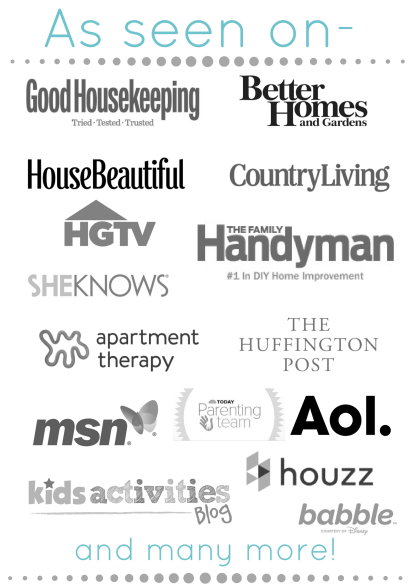 This will give the feeling and appearance of a rounded edge. 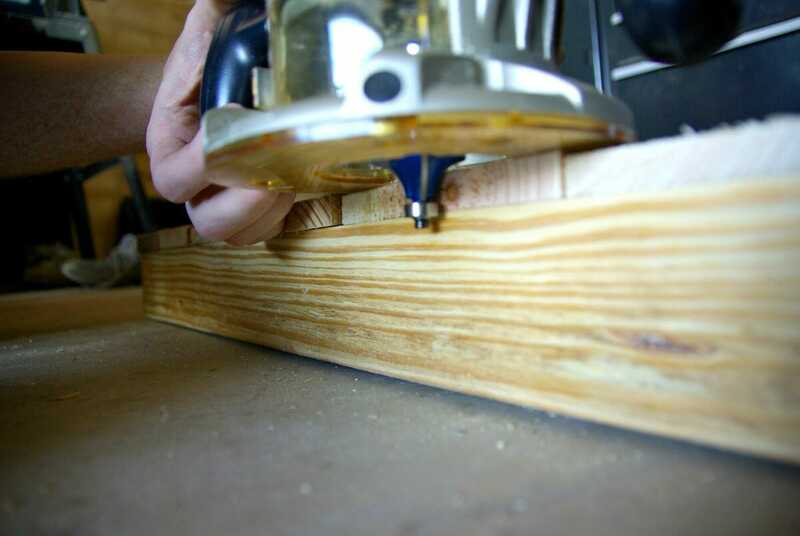 This can be done with just sanding it as well if you do not have a router tool. Once all 4 sides have been routered, it is time to sand the top. I should note that the routered edge appears uneven in places. Because I used pallet wood for this, not all widths, thickness of wood, and heights are the same. Having a somewhat imperfect edge works really well for this and does not need to be stressed too much. 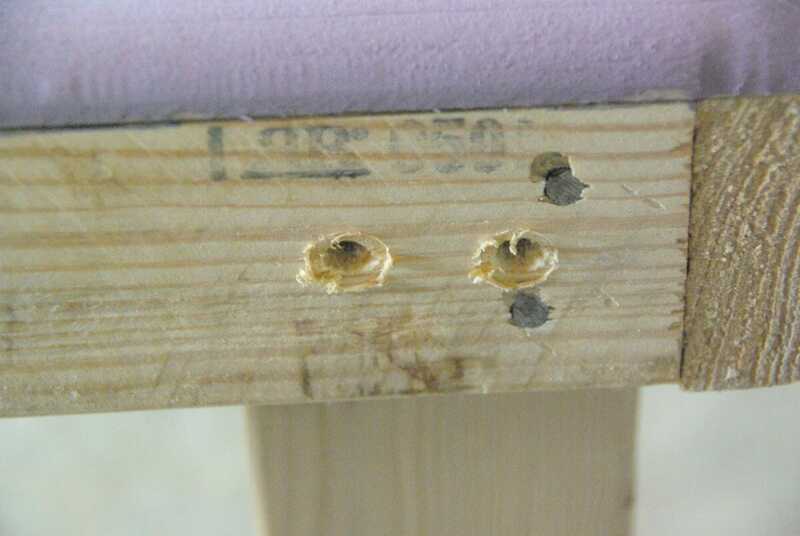 One part that cannot stay rough is the top surface, the portion you sit on. Ouch! Sanding the top of the bench is needed for sure. 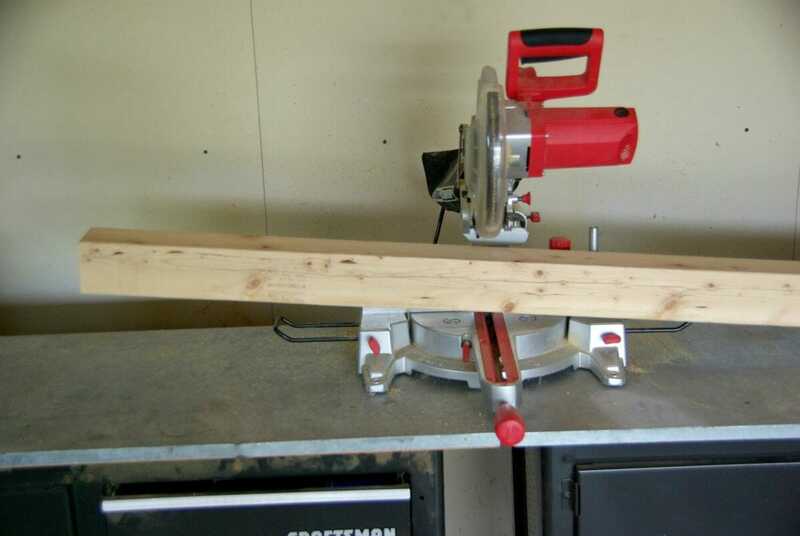 This will allow people to sit on it with shorts or a sun dress without getting cuts from the wood. Also, my kids like to lay on this, which I knew they would do. The less scratches, them loosing it and the eventual need for 10 band aides for one small owie from the bench is always a good thing. I used a automatic sander for this, to move the job along. This can be done with a regular piece of sand paper and just scrubbing away as well. I just sanded off enough to give the surface a smooth finish when running my hand along it. There are a few options for finishing off the look of this DIY wood pallet bench. 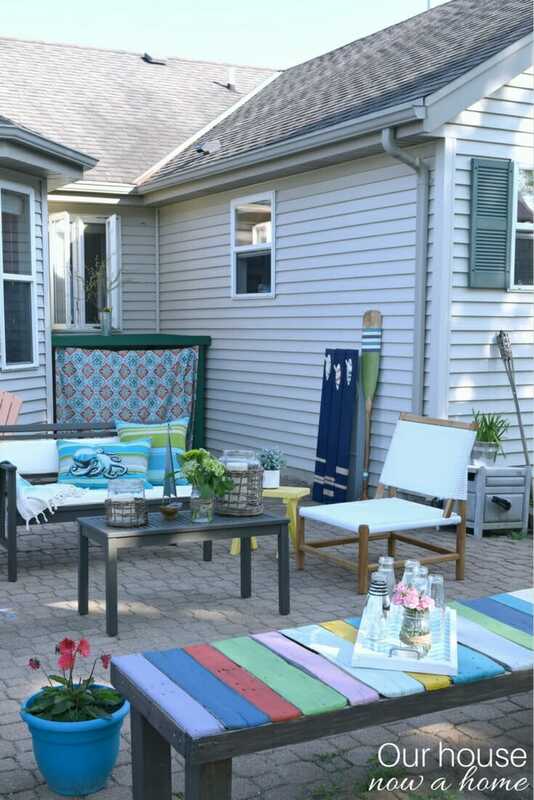 I am choosing to make this be super bright and cheery with a lot of different paints, fitting in with my existing outdoor furniture and decor. The outside is where you can go bold and not have it overwhelm the space. I have a ton of bright paints in sample sizes from various projects, since I would not need a lot of paint of each color this size was perfect. 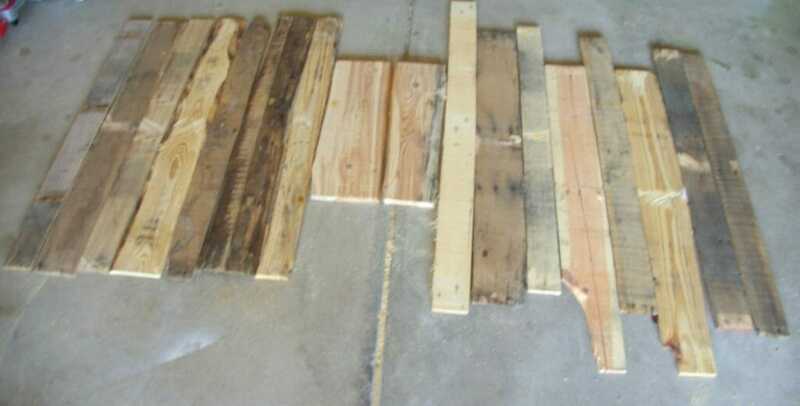 Set them on each plank, there was going to have to be a few repeats in colors for some planks. I was very mindful of making sure each color spread out. For example, no green right next to another green. 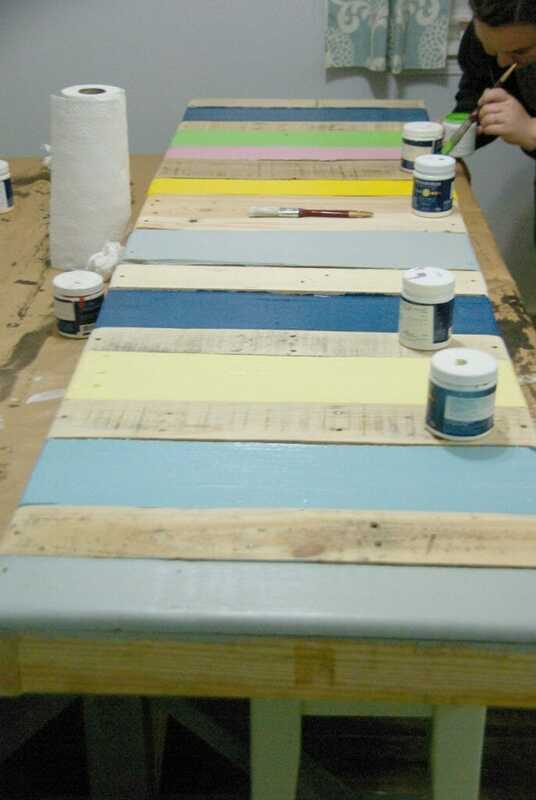 Making the whole bench of different colors on it. My kids call this the rainbow bench, which is very fitting! For most color’s I only needed to do one coat, the sanded seemed to do the trick of letting the paint adhere to the wood nicely. 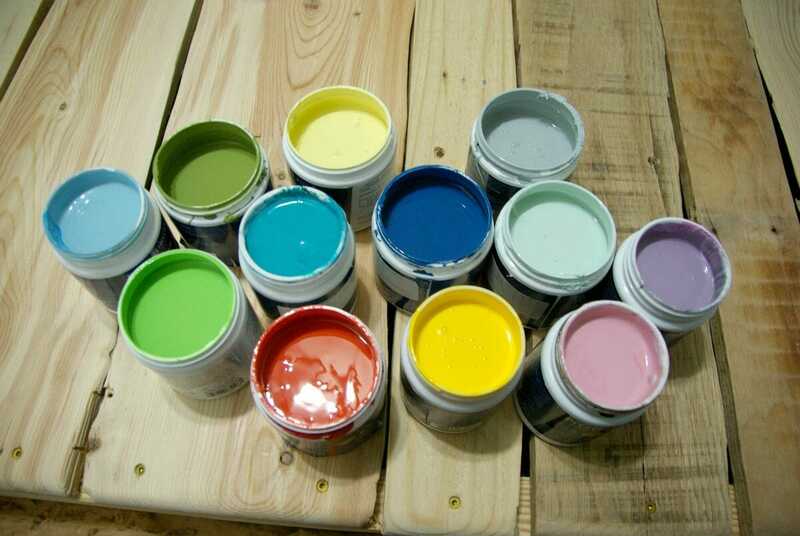 I also used outside paints for this project, this will allow the paints to last longer. The location I am putting my bench gets a lot of direct sunlight and rain. If you are putting yours in a covered area, or inside, using interior paint would be fine. Once the paint was dry, it was time to move on with this project. 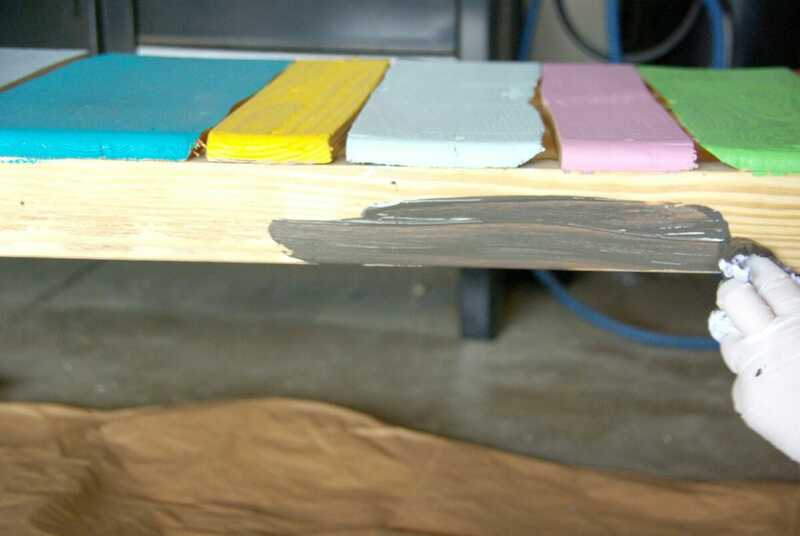 Since no one likes to watch paint dry, I went to work making the legs for this bench while the colors were drying. I am using a 4×4 for the legs. This will have a bulky look to the bench, and give the bench the needed support. Marking the decided height I wanted. 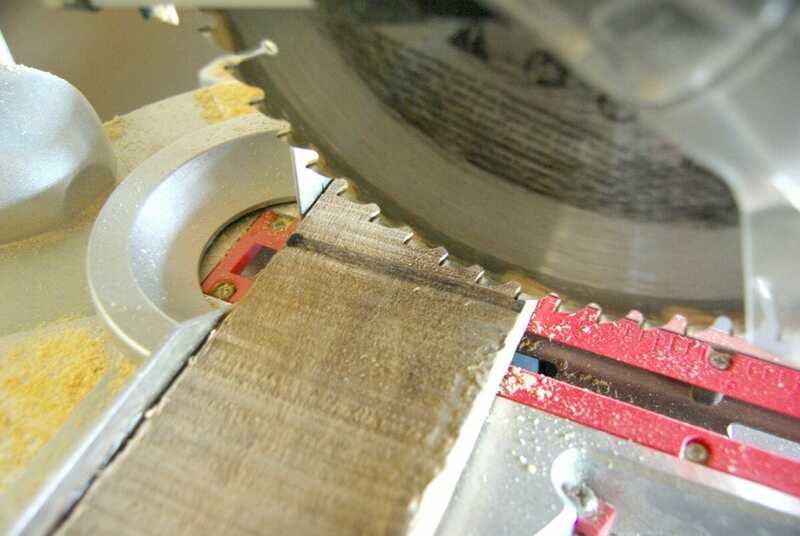 Cutting with the table saw along the marked line. I cut 4 of these to make the bench legs. Set the legs under the bench top to confirm that all are even. 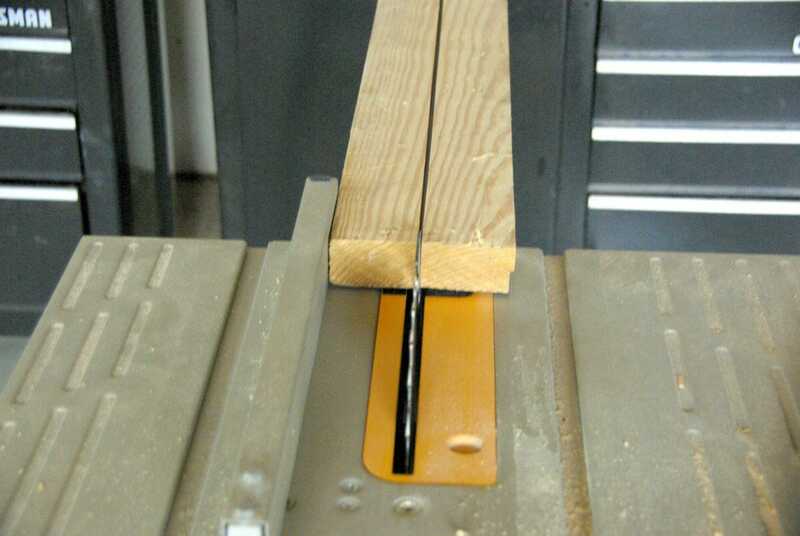 If all lengths seem to be correct, screw into place. With the 4×4 being very thick, be sure to check the size of screw needed. 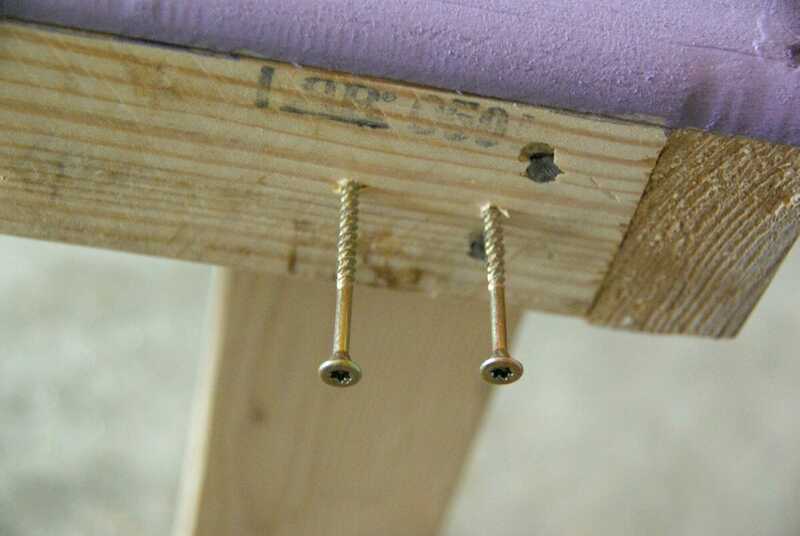 The screw needs to be able to go through the complete 4×4 otherwise it will not be hold together correctly. I want to make sure this will be sturdy enough to sit on, or for my kids to jump off of. Which I know will happen a lot! The bench is now ready to be stained! I selected a outdoor, walnut finish for the staining of the legs and bench frame. 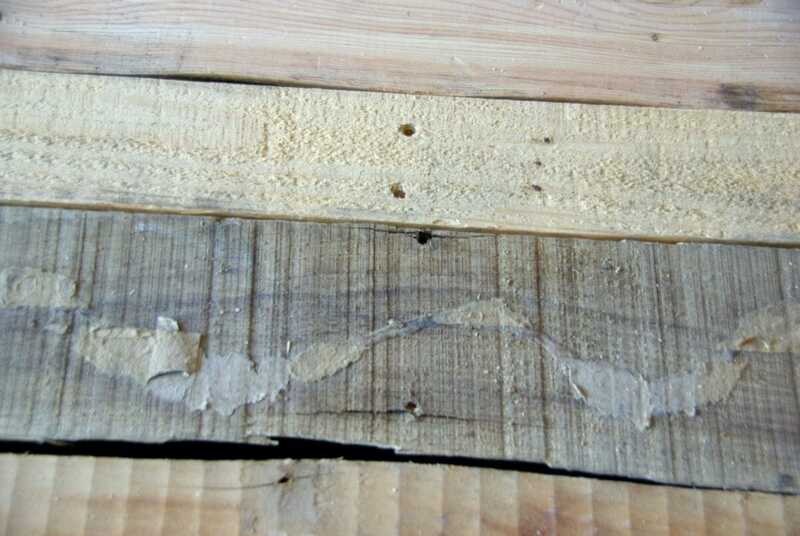 Because this stain has both exterior elements as well as the clear protective coat in it, the stain is very thick. 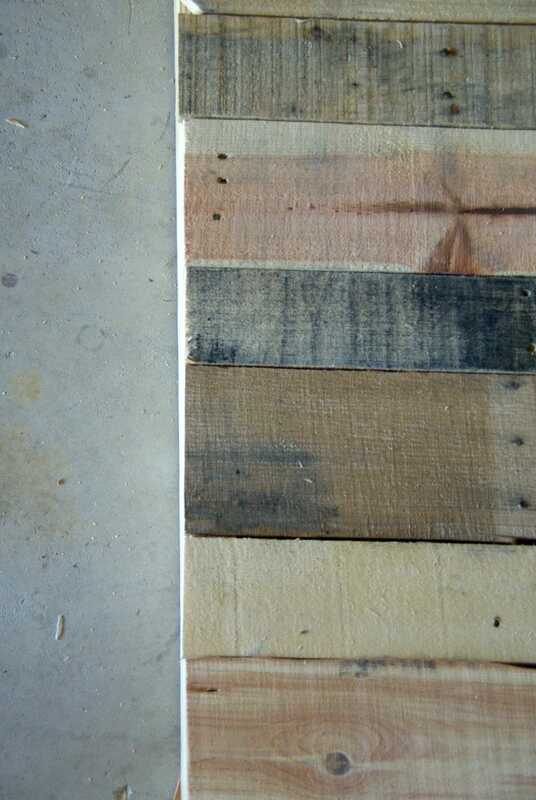 Wipe the stain and cloth on the wood, going along the grain. 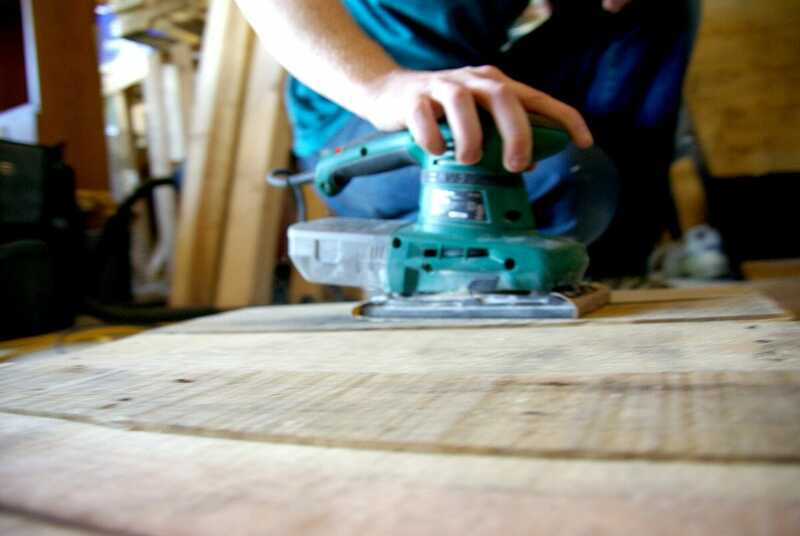 With the thick consistency of this, using a little less and then smoothing the stain into the wood is best. A little goes a long way with this. I did not even have to re-dip the cloth very often. Just simply wiping and re-wiping the already stained area was enough to spread the stain out on the whole of the wood. That is it! 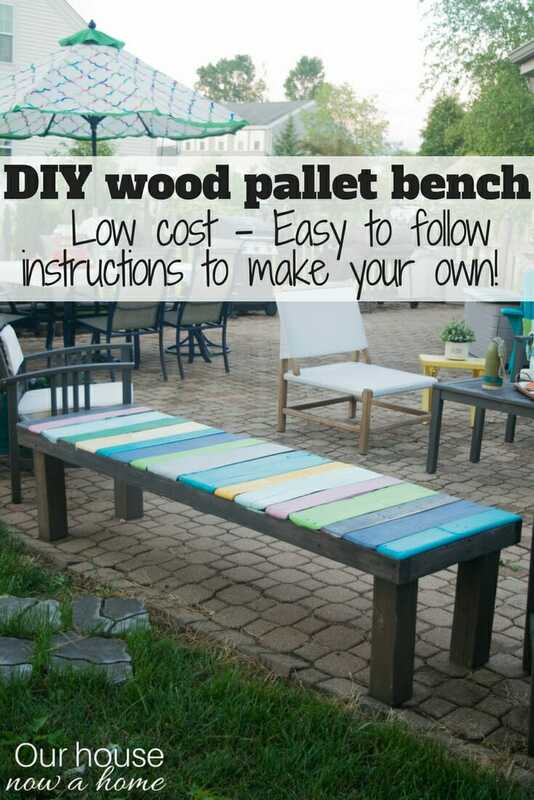 This DIY wood pallet bench, low cost and easy to make bench is done! I adore all of the bright colors. Anywhere else in my home this would be a little too much color. I mean, I like to go bold in my home, but this would be too overwhelming. Outside there is so much space and natural color (hello Mother nature and all of her beauty) so going bold does not feel like too much. 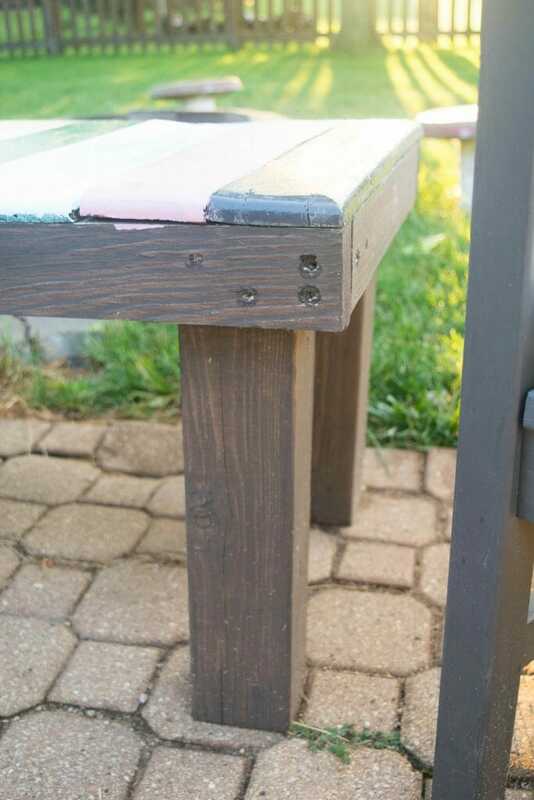 This DIY wood pallet bench is on the rustic side, with the unfinished edges and exposed screws. 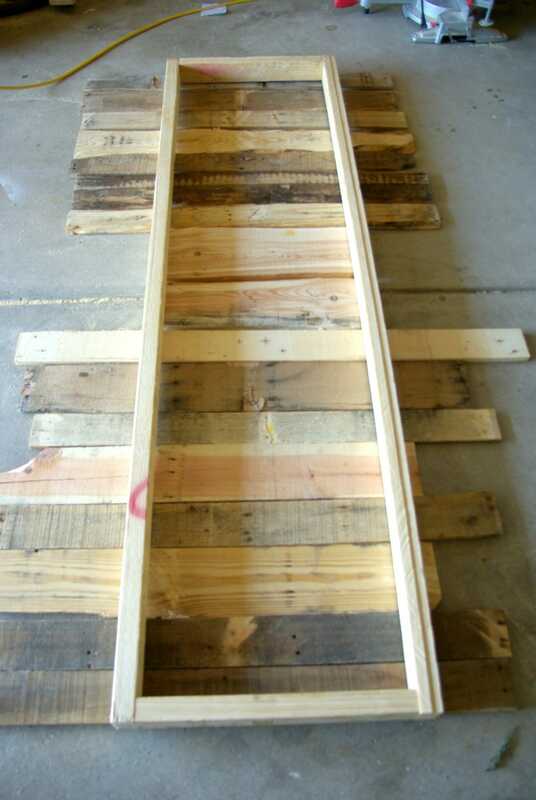 To do a more streamlined version of this using wood instead of pallets and then filling in the holes with wood putty will give a cleaner overall look. I like the rustic appeal to this so I left it as is. This is the hangout spot when we have a bonfire in our DIY fire pit, it is prime location to roast some marshmallows for smores! This adds the perfect touch to my backyard patio! You can never have enough seating in a home, and when we entertain all of these seats have people in it relaxing and having fun. No person stuck standing here. This can also double as a place to sit drinks or snacks, if you don’t have dogs that will sneak the treats too that is. I like that this bench is functional but it also adds to the overall decor of the patio. The colors add color and texture, blending into the rest of the decor perfectly. No reason a bench cannot be part of the decor and not just another furniture item. Overall this DIY wood pallet bench, low cost and easy to make bench was really cheap to make since I received the wood pallets for free and the rest of the items I already had on hand. But, if you are not a hoarder of all of the things like I am this will still come out much less than if you were to purchase a bench this size in the store. 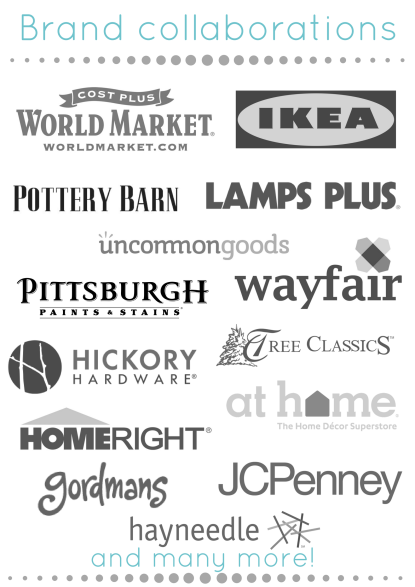 Giving you more wiggle room in your budget for things to fill you outdoor space, new pillows or other big ticket furniture items. 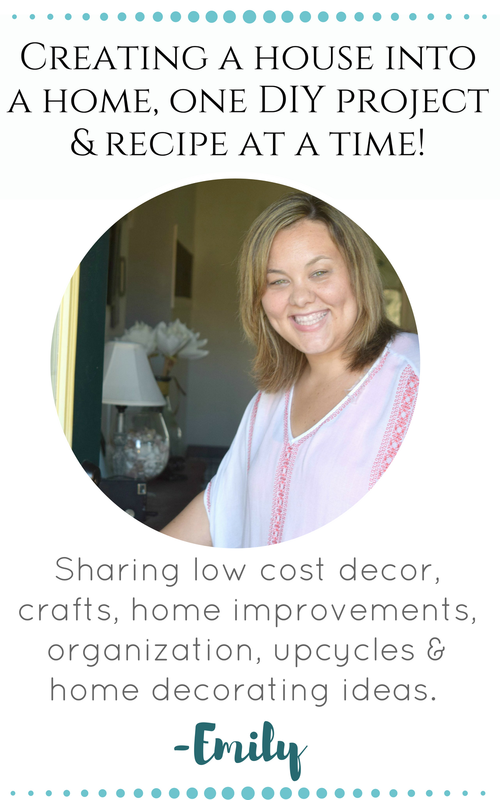 Layering in DIY, simple crafts and new purchase items is what allows me to decorate my home just the way I want. 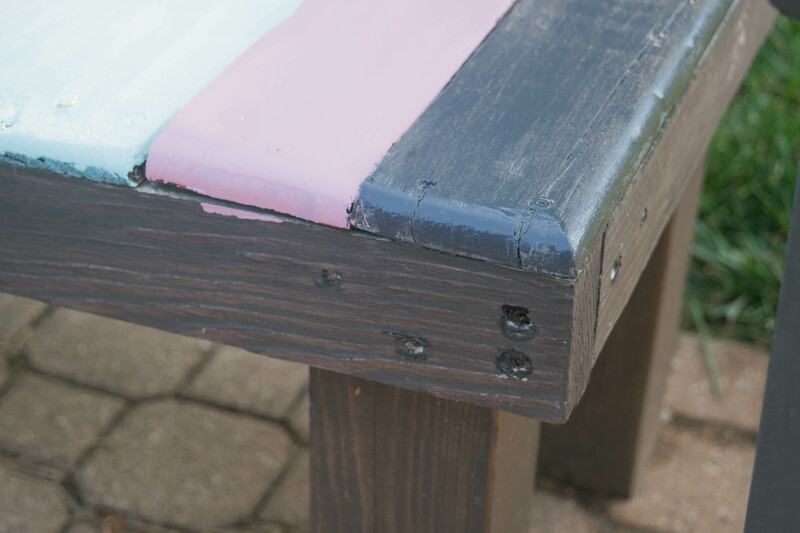 I love, love, love the colors on this bench. 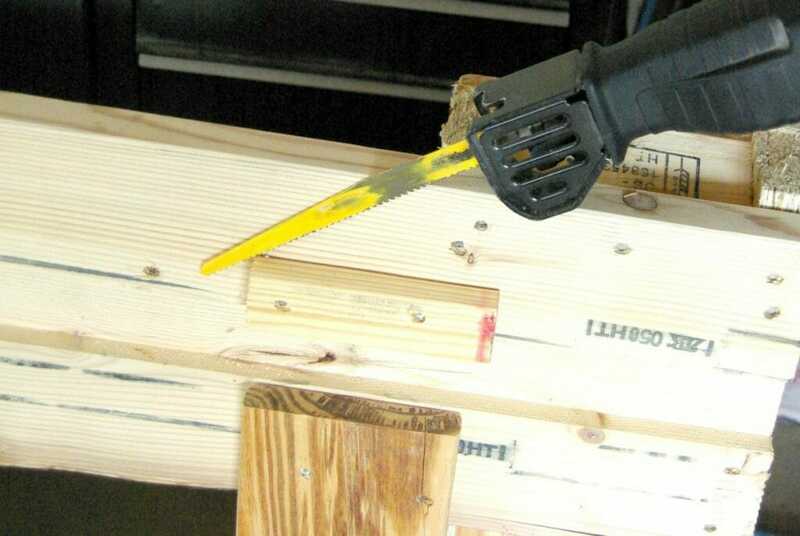 I need one of these, I just need to convince my husband that I wouldn’t cut my fingers off with the saw. How awesome does that bench look! I love how it is so colourful. 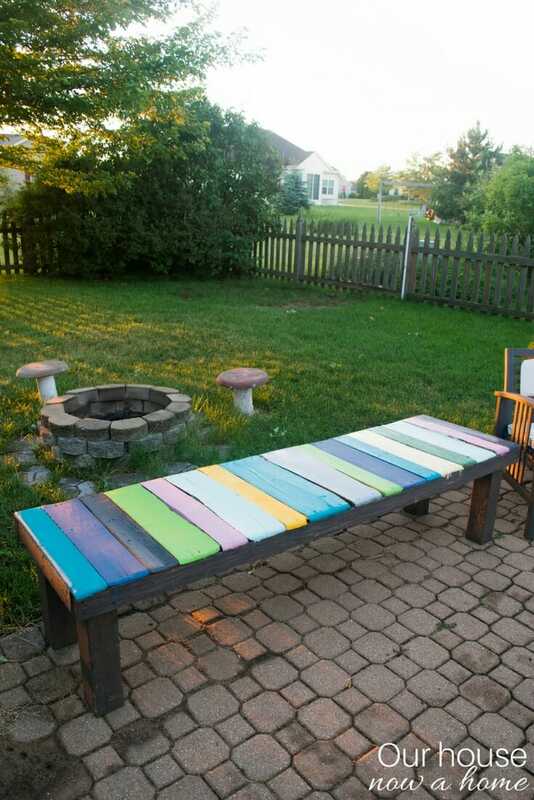 I would never have thought of making a bench using an old pallet but what a fantastic idea! Look at that gorgeous color pop! I LOVE the way you painted it. My husband does amazing things with pallets in the garden. He has a ton of extra so I’m going to show him this. My husband is always looking for new projects. He loves to do stuff with pallets because it’s so easy to get those. 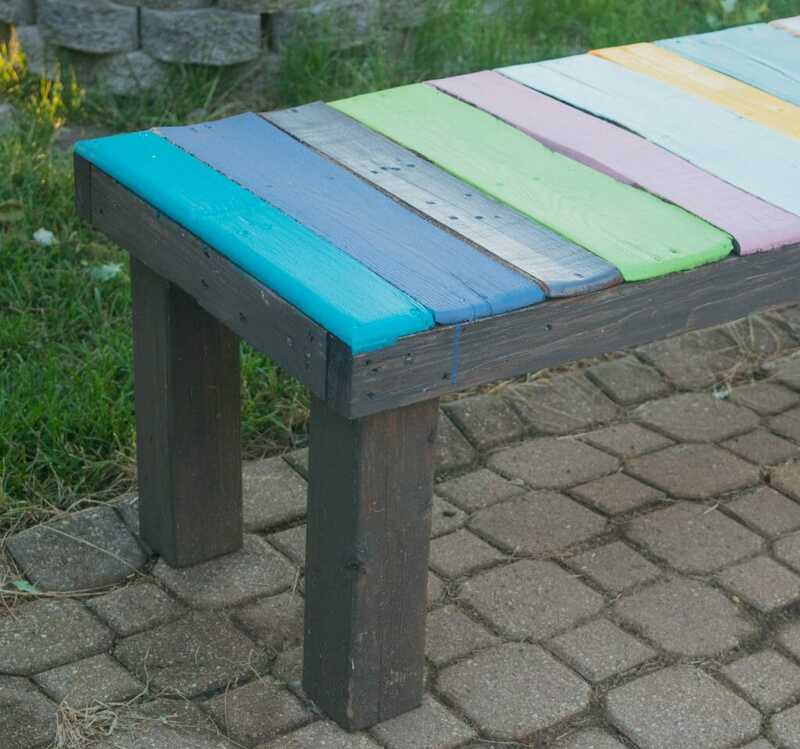 I really like this bench I think I will show him this post so that he can try this pallet project out. I love this idea! What fabulous colors. 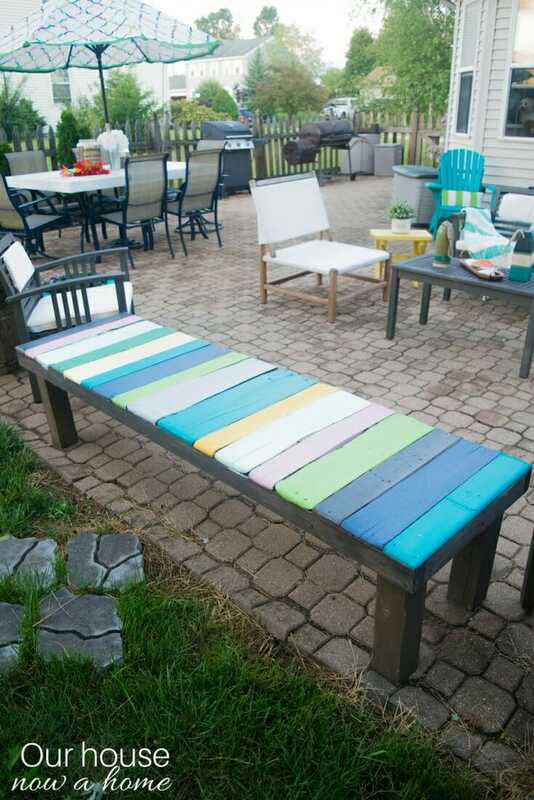 I need to make something like this–we always need seating in the backyard. 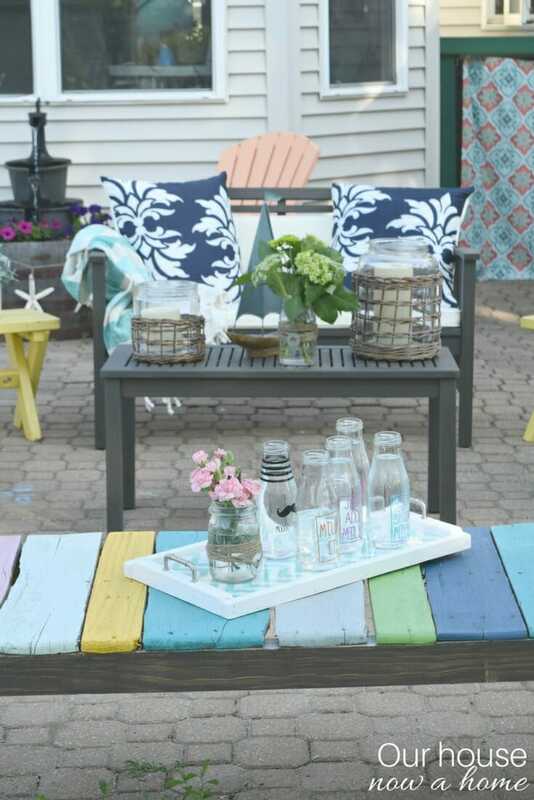 What a fun low-cost way to decorate your backyard! I can totally see us making a few of them put alongside our fire pit. It’s a little tricky to find pallets but I will have to keep my eyes open. You are so talented. I am in love with this, I want to learn a power saw, was it hard to learn. 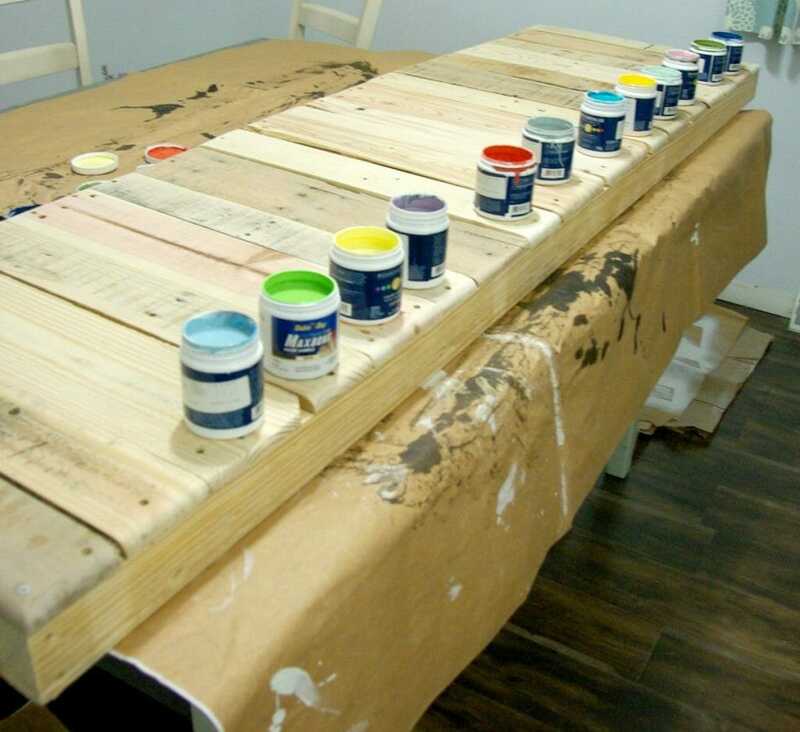 What a great way to repurpose a pallet. I love the bright colors, this would definitely fit in perfectly on my back patio. This is so amazing! 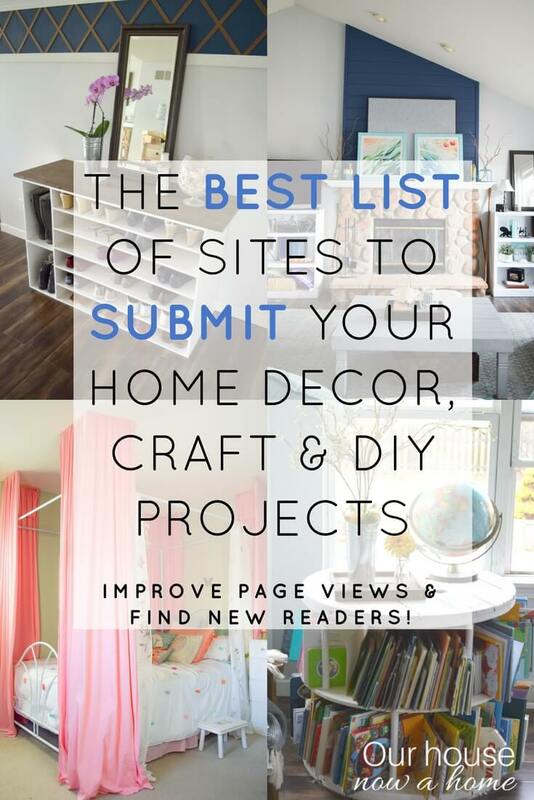 I also love DIY projects but just could not have the time. You are so creative! I LOVE the colors that you painted that bench. There is a place near my house that always has piles of pallets. This would be a great project. This would make a great addition to the backyard for deck for parties. 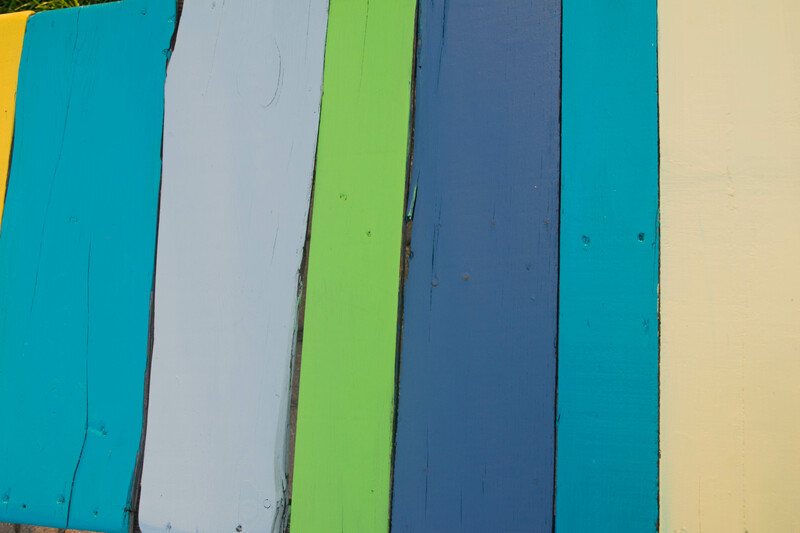 I like how you painted it multiple colors to give it that pop of fun! This looks fabulous! I love your step by step instruction photos. Definitely works well for a beginner like me. I really need to start my own projects. Oh my goodness, that is so cute! 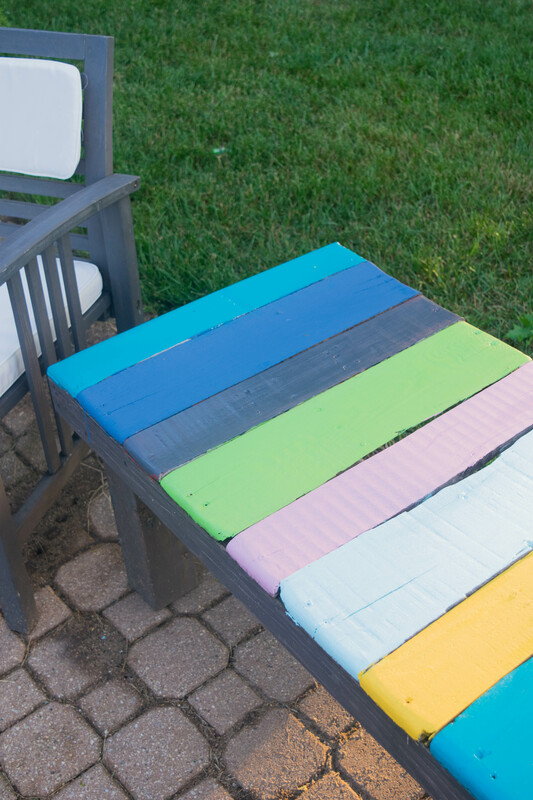 I love the rainbow colors you chose for your bench. It would definitely fit in our yard, bringing joy to all who sit there. Hey Emily, what you have done back there, is totally amazing and out of this world. Even I have all the wood in the world at my neighborhood and all the essential tools with me as well. But never did something so creative as it never crossed my mind! Thanks for such a great idea. This DIY wood pallet bench is indeed a cheap and awesome craft to make especially for the backyard. 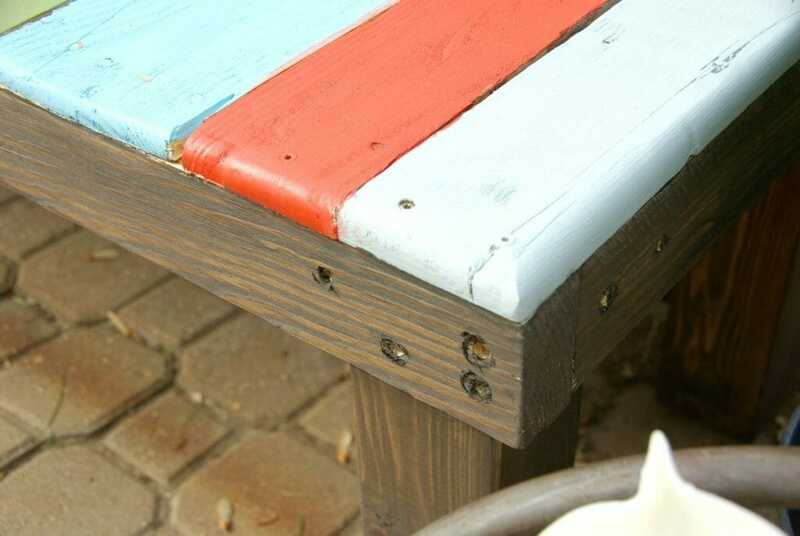 I love the different summer colors you chose for this bench too. Thanks for sharing the instructions and the idea. 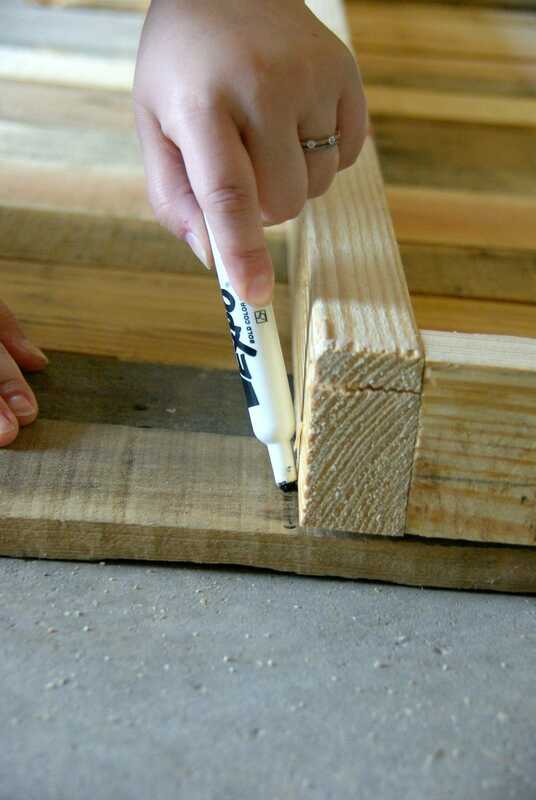 Thanks for sharing this easy DIY bench post. I really love the bright colors you used on the bench. It would be a great addition to any backyard! 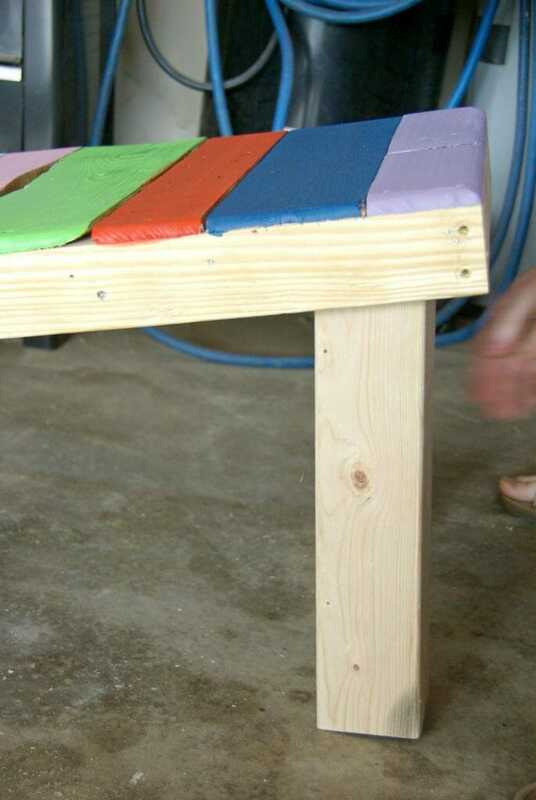 This palette bench is so adorable. I am loving all of the different colors. It would give a great splash to my outdoor area. I love everything about this, I’ve been wanting to make something like this for a long time. We are buying a bigger home next year and this is one of the first backyard projects on my list. I also want to do one with cinder blocks. 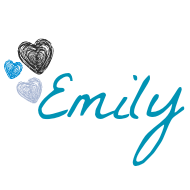 I love your bench, Emily! Wow, the colors are amazing too. I’d love to try and make one myself. Great job! 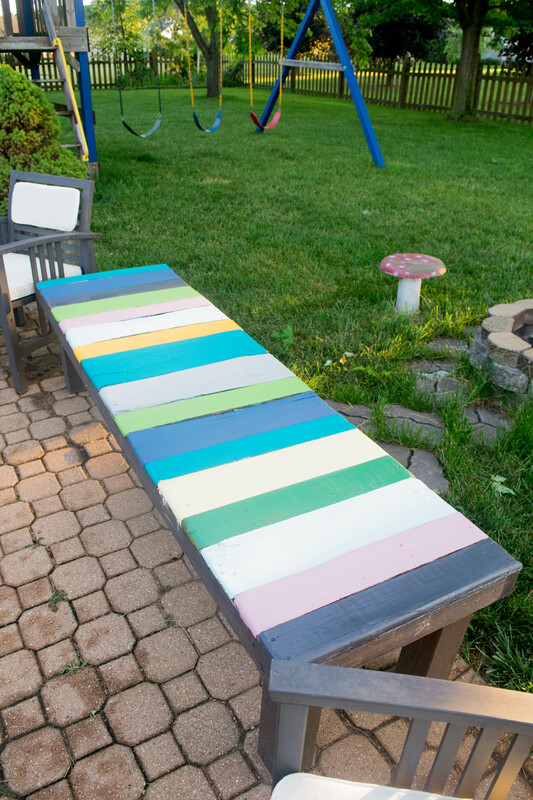 I love your DIY bench! 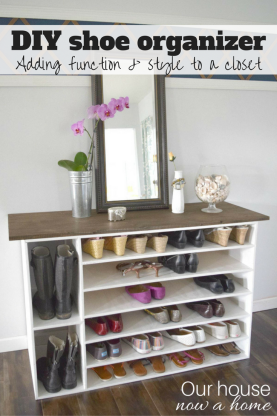 It is so easy to diy stuff like the one you made when you have the right tools to use and also tons of creative ideas. That bench looks wonderful! All of the different colors really make it stand out and let it go with many different decor colors. I think I can do this without my husband’s help. I just need the right materials and equipment.